Last updated May 24, 2013. Created by mike stewart on May 29, 2007. Edited by irohit786, radimklaska, cweagans, jacobbednarz. Log in to edit this page. Use these development tools to help you create Drupal sites faster and with less effort. If you have a favorite Drupal tool that is not listed, make sure you’ve checked every section of this document. Toolname (Free/Commercial. FOSS/Proprietary. OS Platforms.) – Description. Internet Explorer Application Compatibility VPC Image, provided by Microsoft, allows the testing of multiple versions of Internet Explorer on Windows through the use of VirtualPC images. Note that the images expire after a specified date. VirtualPC is a free download, but proprietary and for Windows only (For similar Virtualbox images, see below). Web Developer Extension – Adds a tool bar and menu to the browser with various web developer tools. For example, you can disable form fields; reveal hidden form elements; edit CSS in real time; and clear the browser cache and session cookies. FireFTP – An FTP plugin for Firefox. YSlow – A Firefox add-on integrated with the Firebug web development tool, YSlow analyzes a web page’s performance and returns a “performance report card” that shows how well the page utilizes a set of best practice guidelines for high performance web sites. Page Speed – Similar to YSlow, Page Speed Firefox/Firebug add-on allows you to evaluate the performance of your web pages and to get suggestions on how to improve them. There is also a Drupal for Firebug module, which includes a Firebug extension. As above, Firebug Lite is available as a “bookmarklet” to provide a subset of Firebug’s functionality in Chrome. In the world of pure Linux/Unix, the most popular editors are the intimidating but powerful Emacs and Vi. Devotees have long argued the merits of which is better. You’ll want a cheat sheet to learn either, but serious users find that Emacs and Vi allow fast, touch-typed editing that’s quicker than using a mouse-based desktop application. Dreamweaver (Commercial. Proprietary. Mac and Windows.) – A WYSIWYG HTML/XHTML, CSS, PHP, XSL/T editor, and there’s a free Drupal API extension for Dreamweaver. Notepad++ (Free. Open Source. Windows only.) – A light-weight notepad replacement with tabbing and syntax highlighting. TextMate (Commercial. Proprietary. Mac only although a Windows clone exists) – A couple of Drupal specific bundles are available, the PHP Drupal bundle which has the most features and another by Steven Wittens which allows tab completion of function signatures – both can exist without conflict. A lot of the power of TextMate is in its bundle system and it has built-in support for diff which speeds up the rolling and applying of patches and many more. TextWrangler (Free. Proprietary. Mac only.) — Lets you read and save via FTP/SFTP, and supports grep and Show Changes (diff). Coda (Proprietary. Mac only.) – Editor for web pages (HTML, CSS) with preview and FTP capabilities; has a Drupal plugin. IDE’s expand on the ability of a simple text editor. Here is a list of IDE’s that work well with PHP and Drupal. Note: There is also a Drupal IDE group dedicated to setting up an IDE for Drupal development for starter tips, and ongoing interactive discussions. PHP Development Tools (PDT) from The Eclipse Foundation. This is generally considered the new version of PHPEclipse. Open source and community supported. PDT provides a PHP Development Tools framework for the Eclipse platform. PHP Development Tools (PDT) from Zend. Same as above but from Zend. Another commercially supported PHP development using Eclipse from version 3.3+. PHPEclipse project is the original PHP development plugin for Eclipse. This is considered the previous version. The new version is called PHP Development Tools (PDT). See above. How to install Eclipse and configure it for Drupal. Read details of how to install and configure Eclipse for Drupal. To get a nice “all in one” package for working with PHP in Eclipse try the Easy Eclipse PHP distibution which includes PHPEclipse as well as SVN and other common plugins. Note that if you are using Easy Eclipse on Windows Vista, you are advised to change the install location to “C:\EasyEclipse for PHP 1.2.2.2”, as the software will probably not work with the default install location. Aptana (Free. Open source, though some features, notably SFTP support, require a commercial license. Linux, Mac, Windows and others. Java based.) — A full-featured Web Development IDE. A package based on the Eclipse environment that comes with the essentials right out of the box (PHP highlighting, ftp/sftp, code browser, etc). Netbeans cross-platform IDE with full PHP and debugging support. (Free. Open Source. Linux. Mac. Win. Solaris). Supported by Sun Microsystems (Oracle). Firefox extension easy Xdebug makes debugging easy with Netbeans. In context HTML, CSS, PHP reference makes it easy to find help on code syntax without leaving the file you are working on. Bluefish Editor (Free. Open Source. Linux. Mac. Fast Lean multi syntax WYSIWYN editor – GTK+ based). A lightweight, fast, multi-syntax IDE that supports projects, multiple documents, ftp/webDAV/sftp/http/https/samba, user custom integration with many programs like make, lint, weblint, xmllint, tidy, javac, more…, multi-language translations, etc. Just an awesome text editor on steroids. Quanta Plus (Free. Open Source. Linux – Part of the KDE environment). Geany (Free. Open Source. POSIX > GTk+. Linux. Mac. Windows. Fast lean multi syntax – GTK+ based). Xcode (Commercial, free with Mac OS X. Mac only.) Here are instructions on setting up Xcode to work with Drupal. PhpStorm (Commercial. Proprietary. Windows, Mac OS X, Linux. Java Based.) Code hinting, X-Debug. There is software that can aid your SQL and database needs with features ranging from queries to administration. DbVisualizer – Free & Commercial universal db tool for linux, windows and OSX. Works with any database that has jdbc drivers available. phpMyAdmin – Industry-standard PHP tool for querying, modifying and administering a MySQL database, included in most shared hosting packages (if not, find a different host! Or just install it yourself, not hard). For local database installations you could tryphpminiadmin which is an order of magnitude faster than phpMyAdmin, but has fewer features. Adminer – Adminer (formerly phpMinAdmin) is Free & Open Source, full-featured database management tool written in PHP. Conversely to phpMyAdmin, it consist of a single file ready to deploy to the target server. Adminer is available for MySQL, PostgreSQL, SQLite, MS SQL and Oracle. See also Adminer vs. phpMyAdmin comparison. pgadmin3 (Free. Windows/Linux/Mac PostgreSQL). Industry-standard for administering a PostgreSQL database, the SQL99 reference database. Runs from your desktop, SSL aware, no need to install anything on your server. The application also includes a syntax highlighting SQL editor, a server-side script editor, an SQL/batch/shell job scheduling agent, support for the Slony-I replication engine and much more. MySQL Workbench (Free. Windows/Mac/Linux. Source available. MySQL only.) – A GUI from MySQL allowing developers to design, model, query and administer MySQL databases. Replaces the MySQL GUI Tools Bundle. Toad for MySQL (Free. Windows. MySQL only.) – Toad for MySQL Freeware is a tool that improves the productivity of developers and administrators by providing an easy-to-use development environment. FlySpeed SQL Query (Free. Windows. MySQL/PostgreSQL) — Builds queries without needing deep knowledge of SQL syntax and performs data manipulations such as export and reporting. PuTTY (Free. Windows only.) – An SSH and telnet client. WinSCP – WinSCP is an open source free SFTP client and FTP client for Windows. 7 Zip (Free. Open Source. Windows is the primary platform, with ports listed on thedownload page.) – Extracts archived and compacted files (such as tarballs). Cygwin (Free. Open Source. Windows only.) – Allows Windows users to use a Unix like shell. This is particularly useful for interfacing with git and patching files; read more. UnxUtils (Free. Open Source. Windows only.) – a lightweight option for adding some Unix command line utilities such as patch and grep to Windows, for those not wishing to download Cygwin. 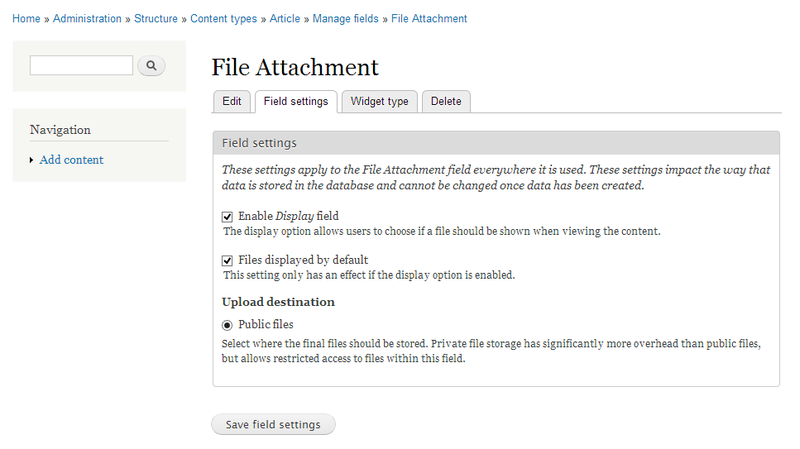 Drupal 7 has replaced the old Upload module (which provided the “Attachments” feature on nodes) with a FileField (as FileField is now in core). 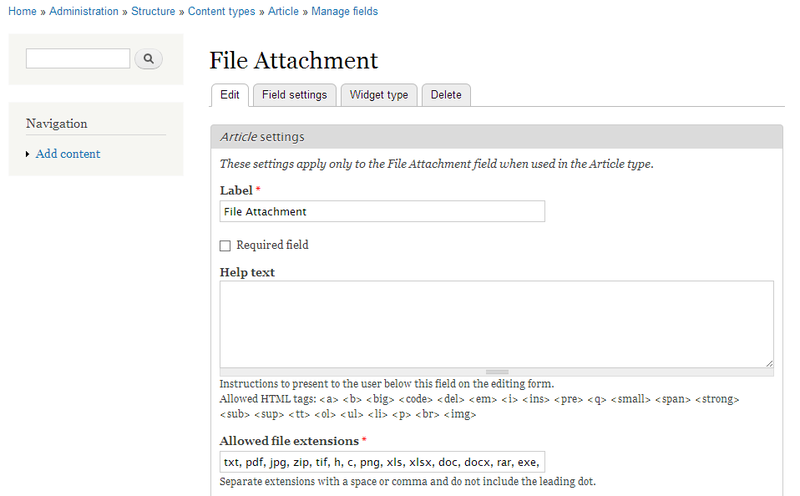 So, while there’s no longer the option to enable attachments for the content type within the main page of the content type edit form, you can now add a new File field to the content type. Once you’ve saved the new field for your content type, the upload form will appear on the edit page for nodes of that type. 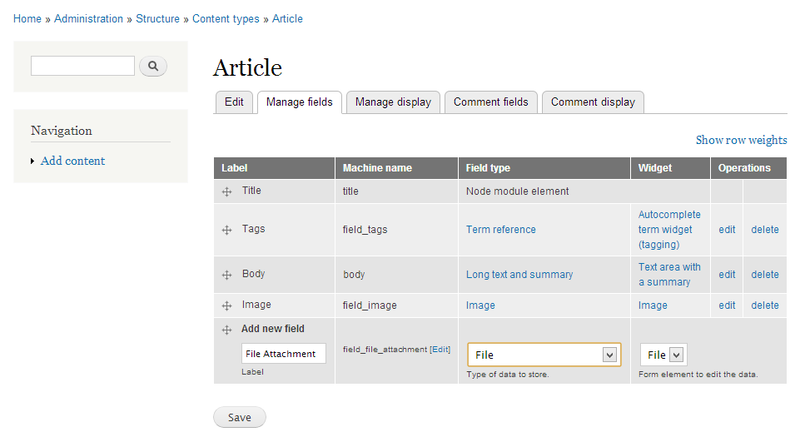 Since in Drupal 7 both nodes and comments are “entities”, you can attach fields to both in the same way. When Comment module is enabled and you click to edit one of your content types, you’ll see both a Manage Fields tab (for fields on the node) and a Comment Fields tab (for fields on the comments for this particular content type). Backup your existing site and database. Update Drupal core, modules and themes to the latest releases for your existing Drupal version. Log in as user ID 1 (the site maintenance user). This is the user name that you created during the installation process for your site. Go to the site maintenance page, select “Off-line” and save the configuration. If you have defined a custom maintenance theme in your settings.php file, comment it out before proceeding. Go to the Themes page, enable “Garland” and select it as the default theme. If you have been using a separate theme for administration, select “Garland” for your administration theme as well. If you are using a custom maintenance theme, comment out 'maintenance_theme' => 'your theme name' in settings.php. Remove all old core files and directories, except for the ‘sites’ directory and any custom files you added elsewhere. If you made modifications to files like .htaccess or robots.txt, you will need to re-apply them from your backup, after the new files are in place. If you uninstalled any modules, remove them from the sites/all/modules and other sites/*/modules directories. Leave other modules in place, even though they are incompatible with Drupal 7.x. and extract:wget http://drupal.org/files/projects/drupal-x.y.tar.gztar -zxvf drupal-x.y.tar.gzThis creates a new directory drupal-x.y/ containing all Drupal files and directories. Copy the files into your Drupal installation directory:cp -R drupal-x.y/* drupal-x.y/.htaccess /path/to/your/installationIf you do not have command line access to your server, download the archive using your web browser, extract it, and then use an FTP client to upload the files to your web root. Re-apply any modifications to files such as .htaccess or robots.txt. Make your settings.php file writeable, so that the update process can convert it to the new format. Open settings.php with a text editor. Once the upgrade is done, $update_free_access must be reverted to FALSE. Backup your database after the core upgrade has run. If you are upgrading from Drupal 6 to 7 and were using CCK (and perhaps additional modules) to create fields for your content types, you will need to upgrade the data in those fields as a separate step. Download the Drupal 7 CCK module, and turn on Content Migration. Go to Structure > Migrate Fields or http://example/com/admin/structure/content_migrate for a page to walk you through the migration process. There are now several types of fields in core, but not every type. You might need to download Drupal 7 versions of contributed modules to support other types of fields (such as the References module for nodereference fields and/or userreference fields). Learn more about migrating content from CCK to Core Fields. Go to the Status Report page and verify that everything is working as expected. Ensure that $update_free_access is FALSE in settings.php. Make sure that standard modules from a typical fresh install are engaged. In a Drupal 6 to 7 upgrade, some modules that may not be engaged are: ‘Dashboard’, ‘Contextual Links’, ‘Overlay’, ‘Field’, ‘File’, ‘Image’ and ‘Shortcut’. Go to the Maintenance Mode page and disable the “Put site into maintenance mode” checkbox and save the configuration. Note that the file structure, particularly the locations of core and contributed modules have changed in Drupal 8. * warning: fopen(sites/default/files/.htaccess) [function.fopen]: failed to open stream: Permission denied in /var/www/jack/includes/file.inc on line 129. Returns an array describing the return type and required parameters of a method. Returns a struct describing the XML-RPC specifications supported by this server. Returns an array of available methods on this server. Returns a documentation string for the specified method.